Hyrbid control DS games, where players are asked to use the face buttons or control pad in conjunction with the touch screen, are a huge pet peeve of mine. 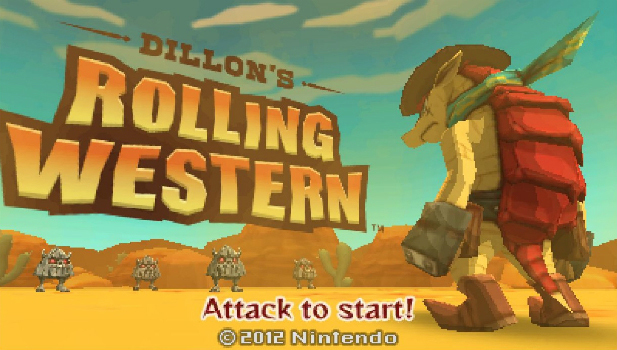 This clumsy and uncomfortable method of playing DS games should be dead, yet here we are with Dillon’s Rolling Western for the 3DS, the latest hybrid control game from Nintendo. I’ll admit that I almost stayed away from Rolling Western when I had found out it relied on hybrid control, but the idea of Nintendo creating a tower defense game with a new character tickled my fancy enough that I decided to dive in anyway. Rolling Western encourages players to use the stylus, but I decided to use my regular old greasy thumb as my means of input. 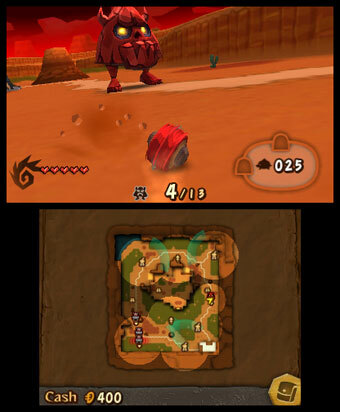 Control for the titular Dillon, a cowboy armadillo, is handled with the Circle Pad, but all of his actions are done through the touch screen. Dillon’s main method of attack is to roll up into a ball and dash forward. This is done by dragging back on the touch screen and then letting go to launch him. This spring loaded action works well enough, and it should, as it’s also Dillon’s main mode of transportation. Most travel on the world map will involve players constantly flicking Dillon to keep his momentum going in order to make the most of their precious time, and in Rolling Western, time is of the essence. At the heart of Rolling Western lies a very simple game of tower defense. Each stage is broken down into three days in which Dillon is tasked to protect a village. Each day comes in two sections, the first part is a timed grinding and exploring section, while the second part is a siege against the Grocks, Rolling Western’s rocky antagonists. The exploration sections gives players the chance to learn that stage’s map, find hidden trinkets and mine for loot, as well as set up defensive towers. The siege sections are essentially just straight up combat and taking care of towers. As the days progress, the grinding sections get shorter while the siege sections get longer, by the final day players will be making mad dashes across the landscape in order to secure the right resources for the long battle ahead. Despite setting up towers to assist in battle, Dillon does most of the heavy lifting by going hand to hand against the Grocks. Touching a Grock on the world map takes the player into a separate battlefield that populates the area with an assortment of enemies. All combat is handled with the touch screen, and despite having some general issues with the idea of the hybrid control, I found combat to be a treat. Dillon mostly rolls into enemies to attack them, but as the game progresses he learns additional moves, like a tap activated melee attack. There’s also a simple yet rewarding chaining system where enemies will drop better loot the longer the chain lasts. While in combat, the Grocks are still moving along on the world map, and the towers are hopefully doing their job. The sense of urgency this creates is what makes Rolling Western work, and once all the mechanics clicked, I was hooked. Well, I was hooked until I hit the second half of the game anyway. 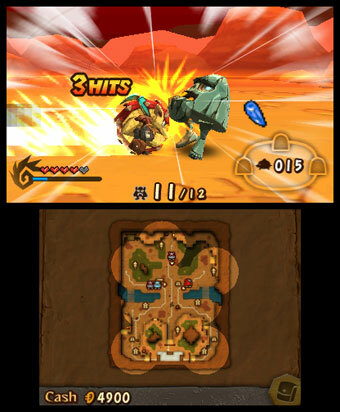 Although Rolling Western is always introducing new enemy types, and new abilities for Dillon to use in an attempt to keep things interesting, the core of the game begins to wear thin. I started to feel a bit of fatigue in later stages from doing the same actions repeatedly. Exploration sections essentially boil down to a grind against time to earn as much money as possible, while the siege sections become overwhelming. In later stages I found myself only being able to build a single tower to deal with the onslaught of bad guys, handling the rest in hand to hand combat. Money is always tight in Rolling Western, but it never seems to balance out as the game piles on more enemies during the siege sections. This essentially strips the game of its tower defense backbone, and the game begins to have an identity crisis as a result. Eventually players may even get to a point where they need to replay stages in order to advance to the next one thanks to a Super Mario style star system to unlock stages. Each stage has a maximum of five stars, and these stars are earned by hitting certain goals, like say, clearing the stage under a set amount of time. The fact of the matter is that it’s impossible to clear a stage with five stars on the first try. This is supposed to encourage the player to replay the stage, and the backwards way Rolling Western forces this upon players as “fun” thing is by allowing them to reenter a stage with however much money they have in their bank account. Sure, this lets the player absolutely destroy the Grock invasions and actually play a real game of tower defense, but to me it feels like a waste of time. Getting maximum stars on a stage isn’t a matter of being skilled, it’s more a matter of having the patience to sit through a stage again. The root of Rolling Western’s problem is that it’s simply too long. Had this been a leaner eight hour game with some optional content, I wouldn’t be so hard on Dillon’s short comings. Considering that the game goes into 20 hour (or more depending on skill) territory, the repetitious bits are harder to shake, and the padding of having to replay levels to advance to new ones simply hurts the pacing. That said, for the couple of hours that I was addicted to Rolling Western, I was certainly enjoying myself. Despite not being into the idea of hybrid control, the snappy combat works great, and the rush of defending the city against a swarm of invaders is satisfying, but Nintendo keeps us in Dillon’s world for much longer than they should have. For the small asking price of 10 dollars, this is easily the most content packed title on the eShop, but I can’t see many people sticking around to see it all.